Custom Embroidered T-shirts with Pocket, Long sleeve and Short sleeve. Custom embroidered long sleeve and short sleeve t-shirts with pocket. 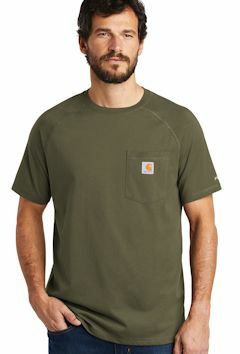 Brands such as Carharrt, Port & Company, Gildan and Hanes. Tagless and Beefy-ts with your custom embroidered logo. A reliable choice for comfort, softness and durability. 5.5-ounce, 50/50 cotton/poly. Made with up to 5% recycled polyester from plastic bottles. 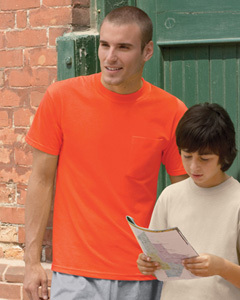 Safety Green and Safety Orange are compliant with ANSI/ISEA 107 high visibility standards for background color. Custom embroidered logo included. **This fabulous Tee comes in EIGHT (8) different styles!! Suit your entire family! 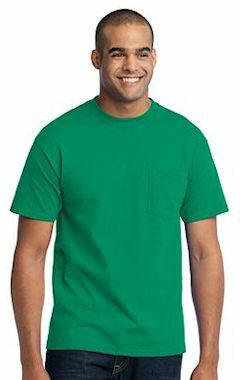 Custom embroidered 29P Jerzees 5.6 oz., 50/50 Heavyweight Blend Pocket T-Shirt. 50% cotton, 50% polyester preshrunk jersey; shoulder-to-shoulder tape; double-needle stitched; seamless body for a wide printing area; 1x1 ribbed collar; Oxford is 53% polyester, 47% cotton; five-point left-chest pocket. Custom embroidered logo included. 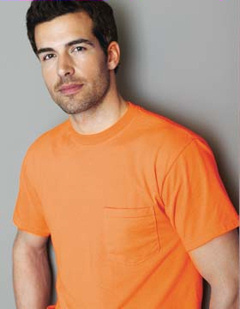 Custom embroidered Hanes® - Tagless T-Shirt with Pocket. H5590. 6.1-ounce, 100% cotton, Tagless for comfort, Double-needle coverseamed neck, Taped shoulder-to-shoulder, Five-point left chest pocket, Preshrunk to minimize shrinkage, Custom Embroidered logo included. Custom embroidered Port & Company PC61P T-shirt with pocket. 6.1-ounce, 100% cotton, Coverseamed neck, Taped shoulder to shoulder, Double-needle sleeve and bottom hem, Custom embroidered logo included in price. Tall Sizes Available! Custom embroidered G830 Gildan DryBlendT 5.6 oz., 50/50 Pocket T-Shirt . 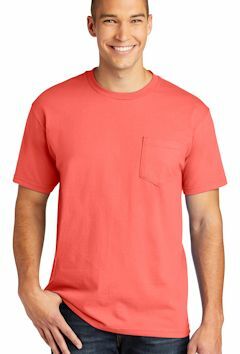 50% preshrunk cotton, 50% polyester; DryBlend® fabric wicks moisture away from the body; double-needle stitching throughout; taped shoulder-to-shoulder; seamless collar; five-point left-chest pocket . Custom embroidered logo included. Custom embroidered Gildan 2300G Cotton T-shirt with Pocket. 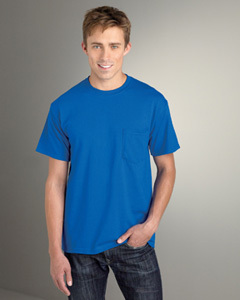 Feature: 6.1oz 100% preshrunk cotton tee (ash is 99% cotton/1% poly). 5-point left chest pocket. Seamless collar. Fully double-needle stitched. Taped shoulder-to shoulder. Custom embroidered logo included in price. Custom embroidered Hanes Beefy-T T-shirt with pocket. 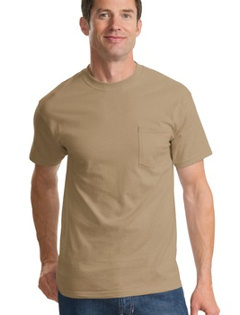 6.1 oz., 100% preshrunk ringspun cotton T-shirt (ash is 99% cotton; light steel is 90/10 cotton/poly) Left chest pocket. Double-needle stitched coverseamed collar and hemmed sleeves and bottom. Taped shoulder-to-shoulder. Custom embroidered logo included. Carhartt's bestselling, no-quit, original work shirt. A classic for 25 years. 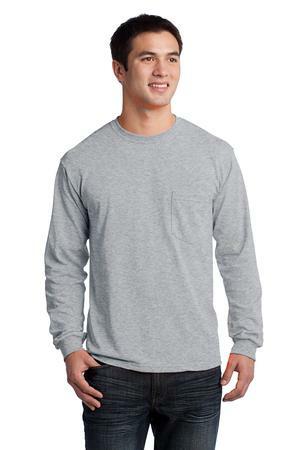 Durable 6.75-ounce, 100% cotton jersey knit. 90/10 cotton/poly (Heather Grey). 60/40 cotton/poly (Carbon Heather, Dark Cobalt Blue Heather). Rib knit crewneck. Tagless neck label. Left chest pocket. Side-seamed construction minimizes twisting. 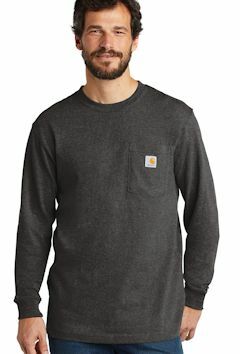 Carhartt label sewn on left chest pocket. Original fit. Includes custom embroidery left chest. This tee fights sweat and stains and is built to work. Durable 5.75-ounce, 65/35 cotton/poly plaited jersey knit. 59/41 cotton/poly (Heather Grey). 60/40 cotton/poly (Carbon Heather). FastDry ® technology wicks away sweat. Stain Breaker ® technology releases stains. Plated knit construction so that poly is against the skin for moisture transportation while cotton on the face pulls moisture to the exterior. Raglan sleeves to increase range of motion. Left chest pocket. Contrast neck tape. Tagless neck label. Smooth flatlock seams. Carhartt label sewn on left chest pocket. Carhartt Force ® labeling on left sleeve. Relaxed fit. Includes custom embroidery left chest. Custom embroidered Port & Company® - 100% Cotton Long Sleeve T-Shirt with Pocket. PC61LSP. 6.1-ounce, 100% cotton, Coverseamed neck, Taped shoulder-to-shoulder, Double-needle sleeve and hem, Custom embroidered logo included. Tall Sizes Available!! See link below. Wear it as a layer. Wear it by itself. Wear it with pride. It's as rugged and dependable as your favorite hammer. Durable 6.75-ounce, 100% cotton jersey knit. 90/10 cotton/poly (Heather Grey). 60/40 cotton/poly (Carbon Heather). Rib knit crewneck and cuffs. Tagless neck label. Left chest pocket. Side-seamed construction minimizes twisting. 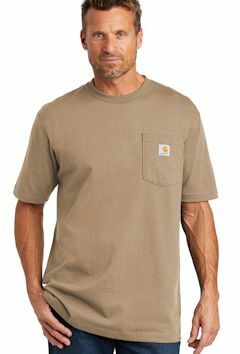 Carhartt label sewn on left chest pocket. Original fit. Includes custom embroidery left chest. 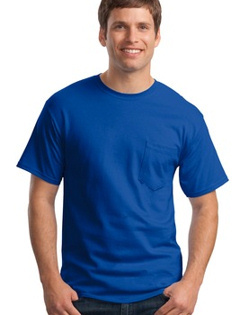 This tee wicks sweat and allows stains to wash out easily, so you can stay focused on the job. Durable 5.75-ounce, 65/35 cotton/poly plaited jersey knit. 59/41 cotton/poly (Heather Grey). 60/40 cotton/poly (Carbon Heather). FastDry ® technology wicks away sweat. Stain Breaker ® technology releases stains. Plated knit construction so that poly is against the skin for moisture transportation while cotton on the face pulls moisture to the exterior. Raglan sleeves to increase range of motion. Left chest pocket. Contrast neck tape. Tagless neck label. Smooth flatlock seams. 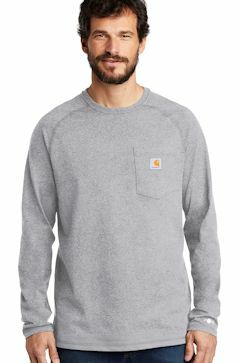 Carhartt label sewn on left chest pocket. Carhartt Force ® labeling on left sleeve. Relaxed fit. Includes custom embroidery left chest.